Ed Sheer-hen visits Kilmacrennan National School! 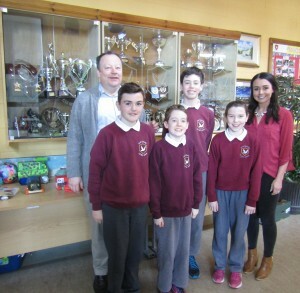 There was great egg-citement in Kilmacrennan National School as pupils took part in their annual chick hatching project. Eleven chicks have hatched so far, and have been given some fantastic names to refer to their chirpy nature. The new arrivals include Ed Sheer-hen, Shell-vis Presley, Chicken Bieber and Egg-del! Now in its seventh year, the project is something that Rang a Sé pupils look forward to each year. This year was no different with fantastic enthusiasm from all pupils. The students taught the younger pupils all about the life cycle of a chicken through PowerPoint presentations and there was great egg-citement in the school when the chicks began hatching. The children were lucky enough to witness a chick emerging from the egg and 11 chicks have hatched so far. The difficult task came when it was time to name the chicks. Due to the melodious chirping the children decided to alter names of singers. Ed Sheer-hen, Shell-vis Presley, Chicken Bieber and Egg-del to name but a few! Well done to all involved and special thanks goes to Stephen Lee , Oran , Ciaran , Darragh and Michael Gallagher for their help in the project. Tá Seachtain na Gaeilge ar siúl sa scoil agus beidh alán imeachtaí difriúla againn. Ina measc beidh Ceolchoirm na Féile Pádraig, Comórtas Ealaíne bunaithe ar sheanfhocail, Tionól Filíochta, Cluichí Clóis i nGaeilge, Lá Leabharlann Gaeilge, Gaeilgeoirí an Lae, Tráth na gCeist ‘s eile. Quiz Team qualify for All Ireland Final! Congratulations to our U-13 quiz team of Ronan, Eoghain, Thomas and Eilis who have qualified for the All Ireland Credit Union Quiz Final due to be held in the RDS in Dublin on Sunday, April 2nd. The team battled their way through stiff competition in the Chapter Final in the Mt Errigal to claim a place in the final. It is a great achievement when one considers the fact that 5,500 teams enter the Credit Union quiz annually. Congratulations to the sixth class team who won the Milford Garda District Quiz in An Craoibhín, Termon on March 1st 2017. It was a most enjoyable quiz with rounds on Irish history & geography, Sport, Current Affairs, General Knowledge, TV & Entertainment as well as Road Safety. They will represent the district at the County Final. Comhghairdeas le Ronan, Rory, Tomás agus Eoghain, na baill ar fhoireann na scoile. 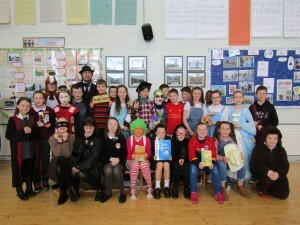 We celebrated World Book Day in Kilmacrennan on March 2nd. 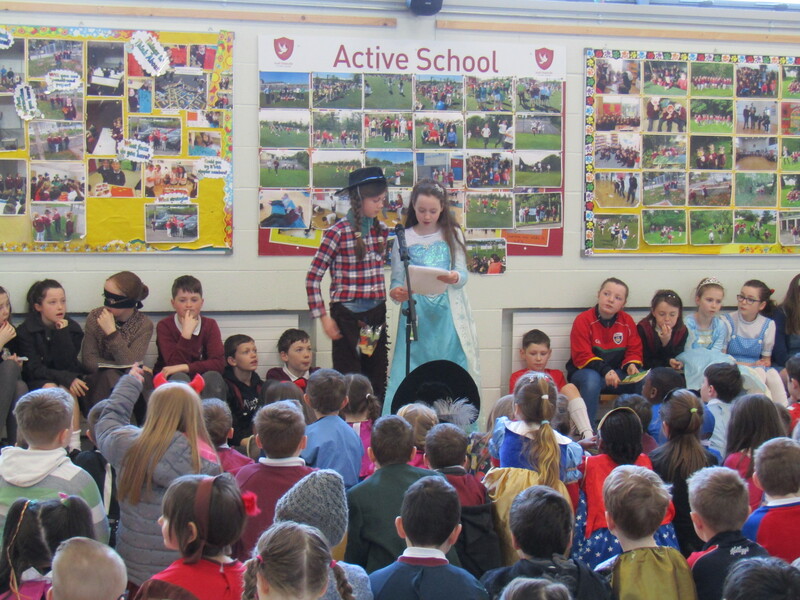 Fifth Class led the School Assembly on the day, reading excerpts from their favourite novels to all the pupils. 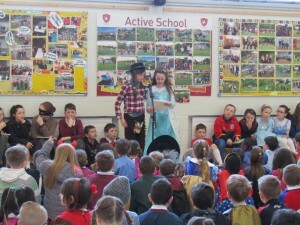 Sixth Class pupils have been participating in the Read Dl initiative. This involved children from various schools across Donegal reading ‘Breadwinner’ by Deborah Ellis. The pupils really enjoyed the book and they attended the closing ceremony of Read DL in LYIT on the day. All classes participated in in-class events such as Art competitions based on their favourite literary/film/book characters with prizes awarded in each class. We also took group photographs of participating classes. These can be seen under the individual class dropbar on the main menuas well as on the Gallery drop-bar.